Our welders at Jupiter Design & Manufacturing are AWS certified and specialize in welding enclosures, pipe manifolds, duct work, and other custom products used in the HVAC and petrochemical industries. We perform flux core arc, gas metal arc, gas tungsten arc, spiral arc, shielded metal arc, and twin carbon arc welding under AWS certification. These processes can be used to weld steel, aluminum, stainless steel, and numerous other metals. Gas metal arc can be used to join a wide range of metals and material thicknesses. Because the wire, which acts as the filler material, is continuously fed, the MIG welding process is very efficient and results in a durable, quality weld for a range of different applications. Gas tungsten arc welding is commonly used when there are burn-through concerns due to the thinness of the material, or for applications in which contamination from the welding material could be problematic. Flux core arc welding eliminates the need for a shielding gas, as the flux core in the wire contains compounds that act as a sort of shield once the welding rod is heated. This makes the equipment very portable, and is therefore one of our favorite options for performing welds in the field or at the customer's facility. Spiral arc welding, also called submerged arc welding is ideal for creating long straight welds in sheet metal allowing us to create custom enclosures very efficiently. We strive to provide the services that best fit our customers' needs, while always keeping operations lean in order to provide the best quality at very competitive prices. 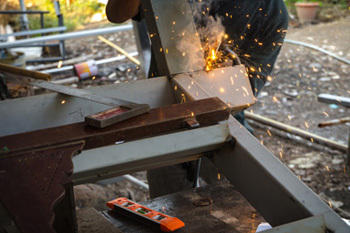 In addition to welding, we perform high-definition plasma cutting, CNC punching, part repair, and assembly. For additional information about our welding capabilities, please review the table below, or contact us directly. This process uses similar equipment as GMAW but in place of standard solid wire uses wire consisting of a steel electrode surrounding a powder fill material. Also known as metal inert gas or MIG welding. Also known as Tungsten Inert Gas (TIG) welding. This process uses a non-consumable tungsten electrode, an inert gas and a separate filler material. This process is sometimes mistakenly referred to as Heliarc welding. Also known as Manual Metal Arc Welding or Stick welding. This process uses a consumable electrode rod, which as the filler material that is covered in flux that protects the weld area from oxidation and contamination.